7 Nights at Ocean Key Resort in Virginia Beach, Virginia! Ocean Key Resort in Virginia Beach, Virginia! Bid Per 7 Night Stay in a 1 Bedroom Suite! Enjoy 7 Nights in a 1 Bedroom Suite at Ocean Key Resort in Virginia Beach, Virginia! One block away from Virginia Beach's beautiful boardwalk and the Virginia Beach Fishing Center, the Ocean Key Resort provides a comfortable, home-away-from home for your Virginia Beach vacation. The property features an indoor splash pool and Jacuzzi, 24-hour fitness center, massage services, and tanning salon. Other amenities include a game room and arcade, activity center, children's area, laundry facilities, and full-service (seasonal) restaurant. This is a smoke-free property. An on-site parking garage is provided for guests' convenience. The Ocean Key Resort is the ideal place to relax and enjoy all the fun Virginia Beach offers. Whether you are looking for a romantic getaway for two or a family-friendly vacation, Virginia Beach is the ideal choice. This beautiful beach resort town is renowned for its boardwalk--popular for walking, jogging, biking, roller-skating, skateboarding, and free performances. At one of America's most pristine beaches, you can swim, surf, fish, sail, water ski, jet ski, parasail, or just soak up the sun. Virginia Beach offers a warm, friendly atmosphere along with superb dining, shopping, and attractions. There are water parks and amusement areas nearby, and 11 top-rated golf courses--including courses designed by Arnold Palmer, Fred Couples, and Pete Dye. 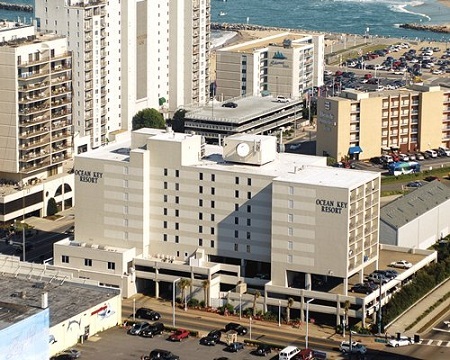 Enjoy theater and dinner theater, the aquarium, deep-sea fishing, or a sightseeing tour. Nearby First Landing State Park offers boating, swimming, nature and history programs, hiking, biking, and picnic areas. Whatever your pleasure, Virginia Beach offers the one beach vacation that everyone loves. Ocean Key Resort's modern and cheerful guest rooms feature kitchenettes with microwave ovens, refrigerators, coffee makers, and dishwashers. All units are air-conditioned, and feature cable television with premium TV channels, and pay movies, DVD players, hairdryers, and multi-line phones. Sofa beds can be provided. Guests can also enjoy housekeeping services. Your 1 BEDROOM SUITE will sleep up to 4 and has a mini kitchen.